Capturing sunrise, butterflies, roads and places are very easy but capturing human feelings in your photo is very challenging task. You have to be very patient till the perfect moment comes to get your desire shot like below shot. Which I got during my photo shoot to Marine drive. Actually I was there to shoot beautiful sunset of Maine drive. 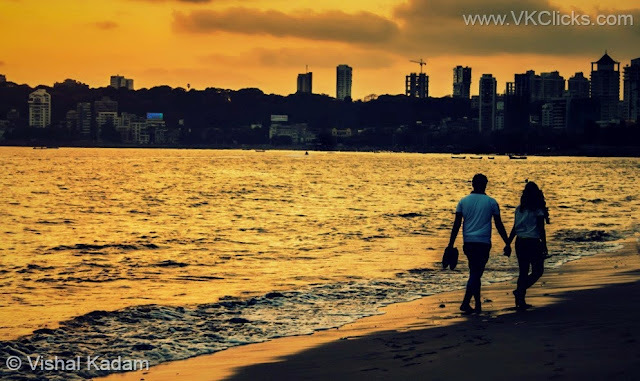 After clicking some stunning shots of sunset, I was about to leave but all of sudden saw one young couple, holding each others hand and walking alone on the beach. They were enjoying their romantic walk and sun was the witness of their moments. they were deeply in love. Luckily I captured that beautiful moment....."A moment of LOVE".